This technology uses high-intensity light in fiber optic cable to transfer up to kilowatts of power. 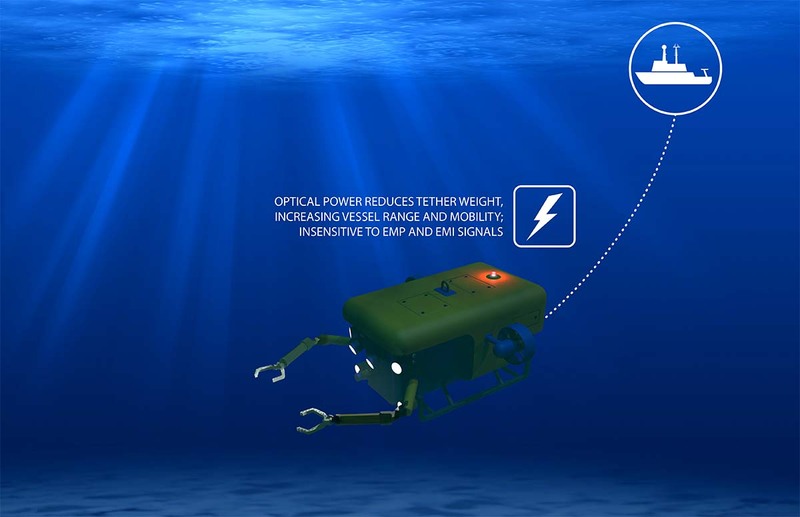 PowerLight Power Over Fiber technology supports tethered unmanned underwater vehicles (UUVs). Compared to the copper tether of traditional, direct drive units, fiber cable is substantially lighter in weight. It is also 10-times less thick in diameter, yet it transfers comparable amounts of power. Enabling the UUV to go far-greater distances, the technology overcomes the severe limitations of other solutions. Power Over Fiber technology eliminates the continuously increasing insulation that copper needs for distance, which creates buoyancy and water drag issues. Industries that can greatly benefit from Power Over Fiber technology with UUVs include defense, oil and gas, and research.